NASA astronaut Kjell Lindgren pulled ESA astronaut Pedro Duque during a simulated moonwalk beneath the Atlantic Ocean. The pair tested a new instrument that allows for the safe and rapid transfer of a fallen companion despite the bulkiness of spacesuits. Space is a harsh, unforgiving environment, so there's a good chance of an astronaut being injured at some point while exploring the formidable landscapes on the moon or Mars. To help cope with this type of potential disaster, NASA and the European Space Agency (ESA) recently tested a new device to bring astronauts safely back to base if they are incapacitated during a moonwalk or Mars expedition. Last week, ESA astronaut Pedro Duque and NASA astronaut Kjell Lindgren spent 10 days in the Aquarius habitat 65 feet (20 meters) under the ocean off the coast of the Florida Keys as part of NASA's 22nd Extreme Environment Mission Operations (NEEMO-22) mission. With the aim of simulating space exploration to test new equipment, procedures and operations, the two astronauts made multiple "waterwalks," adjusting their buoyancy to simulate the gravity of the moon and Mars. NASA astronaut Kjell Lindgren unfolding the Lunar Evacuation System Assembly so he can come to ESA astronaut Pedro Duque's aid in a simulated lunar rescue. Among the new types of equipment that the mission was meant to test was the Lunar Evacuation System Assembly (LESA). Spacesuits add bulk and reduce astronauts' mobility, which would make it challenging to carry or drag a fallen comrade while wearing a suit, according to the statement. LESA allows for the rapid recovery of a moonwalker, even given the limited mobility of the bulky attire. A foldable, pyramid-like structure on wheels opens above the astronaut, lifting the incapacitated explorer and placing her or him on a wheeled stretcher. It took only six months to move the instrument from concept to prototype at the ESA Astronaut Centre in Cologne, Germany, according to the statement. NASA astronaut Kjell Lindgren rescues ESA astronaut Pedro Duque in a simulated lunar rescue. During their undersea adventure, Durque and Lindgren took turns acting as the fallen astronaut. 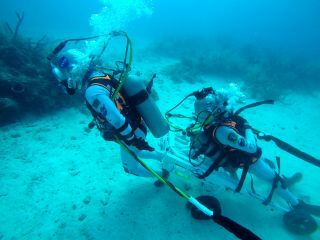 ESA astronaut trainer Hervé Stevenin joined NEEMO-22 to help test the new device. Before its visit to the seafloor, LESA was tested in the Astronaut Centre's large training pool. "We designed it with international cooperation in mind and based on our expertise in spacewalks and experience working with NASA on the preparation of future space exploration," Stevenin said. "This lunar-simulation capability will allow more tests of innovative European hardware for future human exploration of the moon."